I visited this gallery last time I was in Austin. It’s in ‘SoCo’ or the South Congress neighborhood which is chock full of the funkiest restaurants, vintage motels, antique shops, and galleries. The galleries in the neighborhood align on ‘Third Thursdays’ and have their art openings at the same time so that people can make a night of it. We happened upon this gallery on our way out one night and I really enjoyed what we saw there. It was chock full of art by a bunch of different artists. A lot of the work was visionary art, which is art by self-taught artists, sometime done on uncommon materials or every day objects (scraps of metal, old signs, etc). They also had some nice work by emerging artists from Austin. 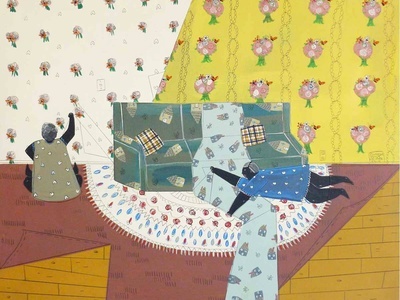 I really loved the paintings by this artist, Andrea Heimer, and thankfully, Yard Dog has a really great online shop where I could revisit her works!